Um, hi everybuddy, Waffles Too here. Um, so Katie...I mean the Boss, says I can take over Wensdays on a trail basis. She tole me it's sposed to be Wordless Wensday and that I should keep it that way. She was kinda bossy about it. Prolly cuz her name is Boss. So until I can figure out what Wordless means, I'll just tell you a little bit about me. 1. My favorite food is Katie's food. 2. My favorite toys are Katie's toys. 3. My favorite blanket is Katie's blanket. 4. My favorite litter box is Katie's litter box. I like the toilet too, but Glogirly always calls me NO when I try to jump in. NO must be like a nickname or something. Oh WAIT! I'm in my very first contest ever! 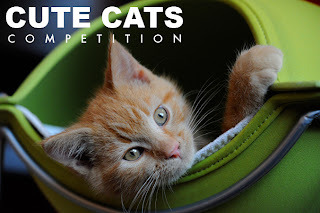 It's a cute cats contest over at Eric & Flynn's Adventures. The Boss let me enter instead of her. There's lots of cute cats too choose from, but you can only vote for one US cat and one UK cat. I'm a US cat. 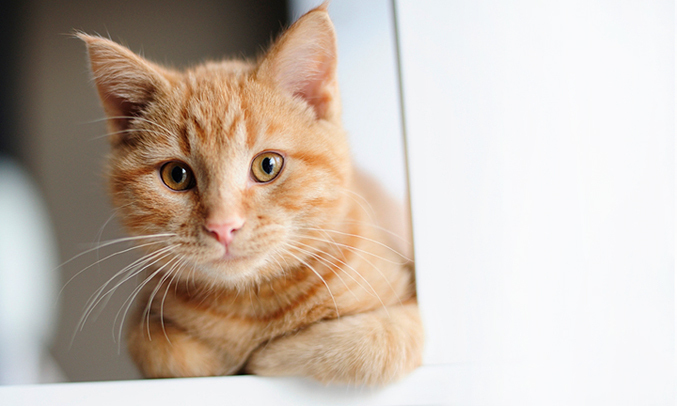 So if you think I'm a cute US cat, can you please vote for me? But you don't have to cuz the other cats are reely cute too. Just be sure to vote. Thanks mew. It must be something with Orange Cats. Sherpa and the toilet have a relationship too. It's a good thing you're living in Katie's world. OMC Waffles Too. The Human just hit a new note on the Squee-o-meter and it hurt my tender ears, yes it did. Waffles Too-you are SO adorable, and thank you to Katie (aka Boss) for giving you Wordless Wednesday!!! We voted and wish you good luck and can't wait to hear more from you! Waffles, you are getting more gronwup looking in your sweet face. We love your golden eyes. Audrey is in th Cute Cats Competition too, so she will going to try to give you a run for your money. Though she really loves that picture of Margs' kitties. And of course you are very cute. Waffles, it sounds like you and Binga have the same nickname. The only difference is that usually humans don't use that nickname as much when you are a grown-up kitty... and Binga is 12. Hmmm....your Boss is certainly very generous. Thank Cod there's no orange cat in our household. One pesky tuxie is enough...ooops...I don't mean you, Katie. purrrr....meow! Good job Waffles, first you get one day and before you know it you've taken over the blog. (formerly the blog of Cindi Lou & The Kitty Krew) MOL! Hi Waffles, lovely to meet you. I think you should always talk on a Wednesday! Good luck in your competition, I am sure you will win! You are so cute we voted for you Waffles. Have a wonderful wordless Wednesday. Katie, are you sure this is wise?!? Judging by his list of favorites, he is seeking a takeover. None of us play in the toilet. But we do like tubs & showers. Have a good day! Hey, Waffles Too...you did pretty good for your first post. Though we're sure Katie is gonna say you said too much. Hehehe. Hey, Waffles! Get yer own favorites and leave Katie's stuff alone! We much prefer Waffles Wednesday to Wordless. Just keep on meowing about you and it will be fine. Mommy has trained the other humans to keep the toilet lids down @ all times unless it is in use. Hi there, stopping by from the blog hop. You sure are a cute kitty and I am a dog, so that should mean a lot. I live with 2 kitties of my own. Have a fun day! How funny sometimes we get called "NO" too Waffles! Waffles, we are voting for you! Don't tell Katie but we love your version of Wordless Wednesday! And of COURSE we voted for you, sweetie! 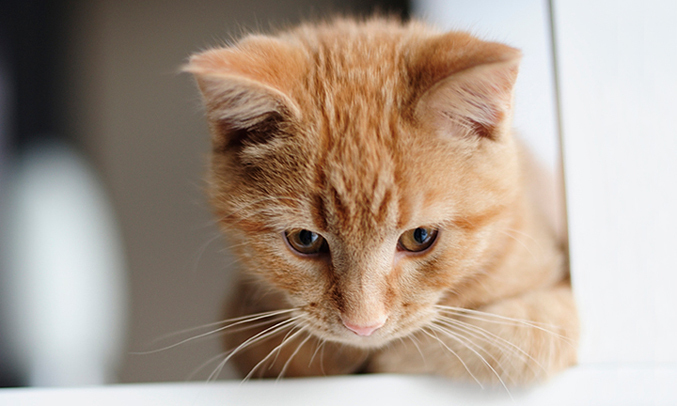 From one orange tabby to another, other cats stuff is always the best! Hang in there! We voted for you and you are winning!!!!! Nice to meet you, little man! Hey Waffles Too! The toilet is very interesting, right? I've been getting a lot of NO NO NO when I do that too. that was the best wordless post of all time. Aw, Katie must think you've got a functioning brain to take over anything! (We knew you did!) Of course, we'll vote for you. We hope you have a happy Wednesday, Waffles, and that you're nice and polite to Katie. Lol, loved learning more about you Waffles. I like the way Waffles Wednesday sounds. Good luck on your contest, I'll pop right over there to cast my vote. Waffles...my mom acts so stoopid when she sees you. I could alllllmost get jellus! You are indeed cute, Waffles Too! We wish you luck in the contest! And... maybe you should make at least one of your favorite things a not-Katies thing.. you know, just to keep the peace? Nice job on your post, Waffles. Though you didn't quite get the wordless Wenesday, we liked the wordy version very much! Waffles, buddy! You've got to get a mind of your own. Maybe when you're a mancat you can stake your own ground. I voted for you over at Eric and Flynn's and it looks like a whole lot of other folks did, too. Who could resist that face? Thanks for coming by with your sister and Mom to wish Dante a happy birthday. My Mom has a soft spot for orange boys, although I think my brother Ping is a dufus. Your sister and I share many of the same thoughts I believe about brothers and tiger cats. We tuxie girls have to stick together. i really tried to boycott Waffles Wednesday but TW made me come over. She loves it when kitties look like their elbows are hanging over the edge of the tree. She has a picture like that of me which she used as wallpaper for a year. Yeah, yeah, W2 is cute but you have seniority. Oh Waffles! I feel I has so much to teach you! I see a Wunnerfull Mentorship in our future. I can teach you ALL KINDs of fings that Katie is just going to LOVE, like Wednesdays should really be WHACK-a-KATIE Wednesday (no need to say nuffin - just "Whack!" away). this is 'specially effective when you whack her while she's busy using the litter box. she will LOVE this game. And that's just Wednesday. Tomorrow, I'll fink of some more fings. Good luck! Kozmo here. Big sisters are really a pain in the patutie! My sister Queen Penelope is always on my case about everything! Still! After 2 years! I have to agree with SparkySpitfire! We think you did a really good ob with your first post, Waffles! NO *is* a nickname. Our mom and dad call US that, too, sometimes! Maybe "NO" is a title like "Mr." or "Miss"? We hear it too. We find the things we like best are usually the things someone else has. You know what, Waffles? "NO" means Good Boy! Keep going! We voted! As of Jan 17, 12:20am EST, you're in the lead! The cool thing about Blogger voting, it shows you the latest results after you vote. Benjamin Bunny can totally relate to your list of likes Waffles. Gracie's food, toys, etc...are his favorite also. And, she thinks she is the boss too. Well, I learned when I first moved in here that black and white girls rule. Sadly, my black and white sister is no longer with us, so us boys sometimes do what our mom says. Sometimes. But ... yeah. That "no" thing? If it's coupled with your name, like "nonoZimmienono!" it's a cheer they do. I mean think about it, Waffles Too. Does GloGirly do it when you're doing something really fun?!?! Yeah. Just as I thought. It's her way of cheering you on. I just KNOW it! Just some words of wisdom for you. One kinda orangy pointy earred guy to another. Sorry Katie, but these pictures of W2 call for a SQUEEEEE!!!!!!! !